CHILDREN OF EDEN - ACMA THEATRE CO.
Based on the stories of Adam and Eve, Cain and Abel, and Noah's trials, this is an energetic, heartfelt, funny, and ultimately inspiring musical about families and conflict, faith and love, and holding on and letting go in parent/child relationships. Sometimes told in choral parts and sometimes in solo songs, the score draws from a range of musical styles including pop/rock, jazz, gospel, Caribbean music, and traditional Broadway show tunes. The music will be performed by a live orchestra made up of ACMA students and alumni, with direction by Jody DeHaven, the Music Director for every ACMA musical since 2008. This show is the culmination of ACMA's Musical Theatre Intensive, a 5-week training opportunity open to students in grades 6-12 in the Beaverton School District. 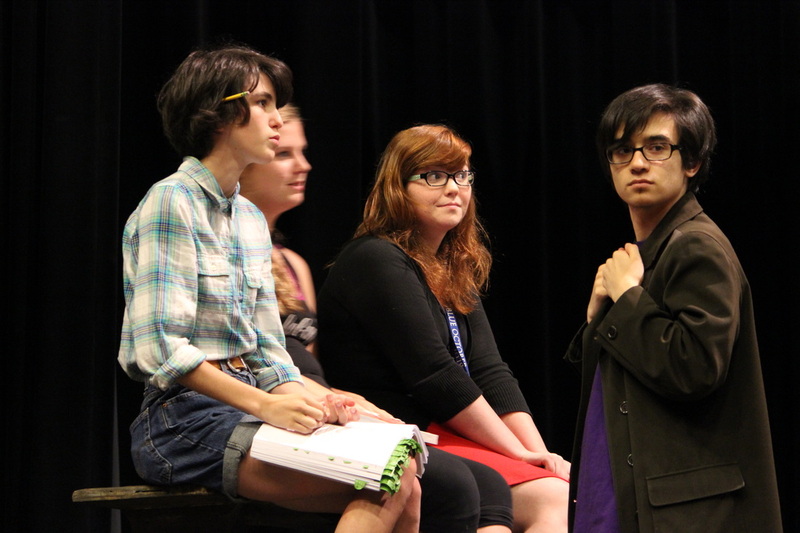 Students await direction while blocking a scene in Act 2. (Left to right) Mia Duckart and Brynn Wightman are both ACMA students; Lauren Hines attends ISB, and Francis Kohler is an actor at Sunset High School. We are so grateful for your generous donations in time and funding of our productions and artistic dreams.